Put bluntly, I was completely knackered after last week’s cold and wet 20 mile run. Even worse, when I awoke on Monday my left Achilles was very painful and I couldn’t walk without a pronounced limp. I suffered from a severely inflamed Achilles tendon after the 2013 Manchester marathon and I was really worried that this was a recurrence of the same injury. 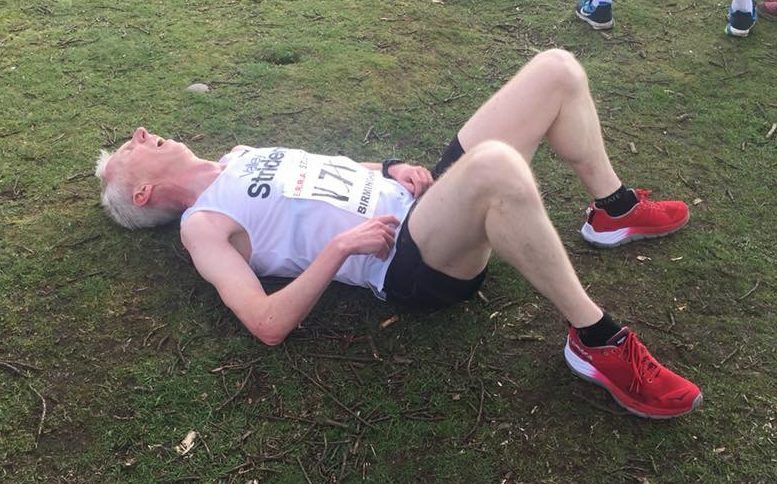 Last year I had to take 3 months off running in the early summer, retaining fitness by cycling, if the same injury had come back, the marathons this year could be scuppered. I had no option but to refrain from running completely for three days. The injury improved quickly and I even headed out for a tester run on Wednesday evening, but after a twinge in the tendon I abandoned the run after 200 yards and returned home. I was probably being paranoid, but a few days off shouldn’t make a difference to my chances in Manchester in 9 weeks. I ventured out for gentle runs on Thursday and Friday and on Saturday turned out for Leeds parkrun, running 19.08 in my heaviest trainers, not feeling too sprightly. I was probably saving myself a little for the Dewsbury 10K on Sunday morning, a race I had targeted as an opportunity to break 37 minutes. As other runners will know, there is a standard procedure the evening before the race to be followed – lay out your race kit : favourite shorts, vest, socks and race shoes. Work out what time you need to set off in the morning. Attach 4 little safety pins to your vest; retrieve your race number from the envelope in the bookcase in that place where you leave all your numbers. I was calmly undertaking these tasks when to my horror I noticed that my Dewsbury race number was for the 2013 event! What the F? Surely I hadn’t forgotten to enter? A quick check of my e-mail folder with all the race entry details and yes, due to complete muppetry I had not in fact entered the race! Feeling a little deflated and annoyed at my own stupidity I sent off an e-mail at about 7pm on Saturday to Bernard Disken, the race director, pleading that I thought I had entered and there must have been a mix up. He responded saying that if I got there early and brought £16 with me, he had a spare number that he would give to me. Phew! Thanks Bernard! Dewsbury 10K is one of the premier 10K road events in Yorkshire – it has a similar profile to the Abbey Dash in Leeds in that it’s a simple out and back along a dull inner city road, with a slight rise going out and a favourable incline for the return. There are always plenty of fast lads and ladies up at the sharp end, with the winner often breaking 30 minutes. To break 37 minutes, I had to average 3:42 per kilometre. I set out purposefully, running 3:34 then 3:39 for the first two Ks. The gradient then kicks up a little, only slightly, but I knew I was slowing. However, I kept working, trying to keep my leg cadence high and working through the field, picking off runners as I went. I was slowing – 3:48, 3:55 then 3:58 saw me reach halfway in 18:50. Sub 37 was looking very doubtful. After the turnaround, I realised that I was moving much more easily and quickly, it was now ever so slightly downhill and the breeze was definitely on my back. The field was getting strung out so there were some bigger gaps and I was often isolated, but I was still passing others from time to time. Check the Garmin each K – 3:35, 3:36, 3:40 – I was clawing it back…blimey, I might just do it – keep going like this, but man, this feels hard now! Come on you lazy sod, go faster! Where is that zip for the mansuit when you need it? I hit 8 K in 29.44. Quick mental maths – I have to run 2K in 7 minutes 15secs to beat 37 minutes – about 3:37 per K, oh, it’s going to be close! Hang on, where has that wind come from? All of a sudden we were running right into the teeth of the breeze, which had switched right around. That scuppered it. Despite giving it my all, including a desperate sprint over the last 300 metres, I just missed out, finishing in 37:06. However, I’m really happy with another PB and looking at the winner’s time – unusually well outside 30 minutes this year at 30:24, the breeze undoubtedly had an effect on the times. I ran a strong negative split of 18:50/18:16 and 18:16 would be my best parkrun time for 5 months, so that’s a good effort. After a lower mileage week, I want to step back up to the 60+ mile weeks, assuming my Achilles remains stable. I’m working in our London office on Monday and Tuesday, I’ll take some running gear with me, but I can’t see me squeezing in more than a couple of 4/5 mile runs – we’ll see.